Micro and nano drones take all of the fun that drones bring and back them into a micro amount of packaging. They’re cute, tons of fun, and come with many surprises. A lot of people overlook these categories of drones, especially nanos, because they’re so tiny, but we’re here to change everyone’s mind! Micro and nano drones are awesome in their own little ways. Some of them have features that are larger than life, while others remain as simple as possible to focus on the flight experience instead. Either way, we love them. It’s great that there are so many micro drone options available. 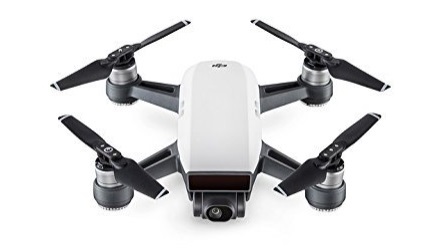 You can find some of these drones listed on our drone deals page as well as other reviews on our best radio controlled vehicles page. We love drones and all hobby toys! Why Should I Buy A Nano Drone? Because there are so many out there, we decided to compile a list of both the best micro drones and the best mini drones to create a mass review. If you’re in the midst of buying a micro or a nano drone but don’t know which one is best for you, this review will definitely help you make a solid decision. 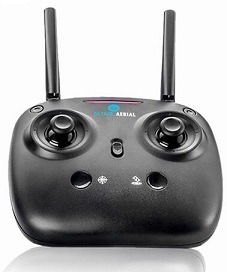 When it comes to choosing one of the efficient and handy micro drones for dronethuthiats, Altair Aerial AA108 is a fantastic drone with some of the incredible features for beginners. 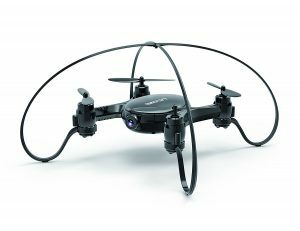 It has advanced fliers that help adjust three skill levels to control flight, making it an enjoyable experience of an apprentice drone pilot. In addition to that, microdrone is perfect for the tasks like recreational flying to photography for first-timers. Altair (a new brand) has launched two new varieties that are not only durable but are excellent in terms of their highly developed flight equipment. AA108 has a maximum flight time of ten minutes and top-tier stability with an ultimate range of 100 meters. 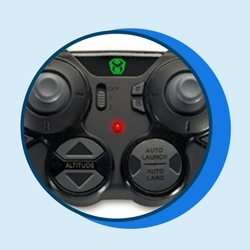 The stable flight control has three modes of handling and adjustability. It has one mode for beginners, one for intermediates and one for experienced flyers. The flexibility of flying the nano-drone according to the difficulty level help beginners learn how to control drone flight and be able to practice being experts at the same time. Besides that, it comes with an instructions manual that provides quick references on how to use the drone’s buttons. The amazing nano drone comes with an excellent 720p HD camera, compatible for both with outdoor and indoor photography. With its horizontal resolution, it never fails to amaze drone flyers with its 720-pixel image. 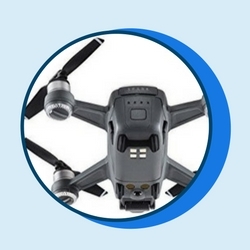 Mini quadcopters such as DJI Spark is also readily available in the market with a plethora of extraordinary features making the flight experience not only simple but fun for you. Its fantastic features among other nano drones include a 3D obstacle sensing system to assist drone sense and save from other obstacles. There is a safety panel attached to the front side of the camera which covers the additional sensors. The camera of this microdrone looks different than other drones. It is mounted on a long gimbal and can tilt up and down. However, drones need to rotate in order to pane side-to-side movement. To add to it, GPS/GLONASS satellite positioning is another incredible feature that improves flight stability and allows beginners to enjoy their drone experience. On the other hand, many drone forums speculated about DJI, naming it only a selfie drone or a racing drone. That is to say, both the augments seem pertinent as nano drones have been designed with some impressive gesture control with the Phantom 4 controller. These incorporated features make DJI as one of the fantastic selfie drones ever! 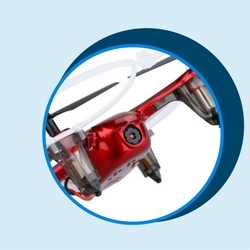 Similarly, its high compatibility with FVP goggles makes it an exceptional racing drone. The overall design of the DIJ spark is not just beautiful, but creative as well. The thick motors give it a robust appearance. 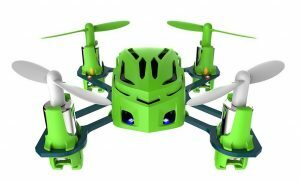 Available in multiple colors, the microdrone comes in green and bright red, with LED integrated on each motor. Its landing gear is made of light silicone material to enhance the impact and to protect against rookie or accidental or hard landings. Plus, it helps the camera adjust its ground clearance. The drone is equipped with an advanced collision avoidance technology to ensure additional protection during landing. Featuring all the signature technologies, DJI Spark has it all to persuade you to buy it instantly. This Holy Stone drone is specifically designed to help teach first-time fliers how to pilot a drone, making it one of the best choices around for beginners, even if it’s unlikely to impress more advanced fliers. Great for training and learning the ropes. 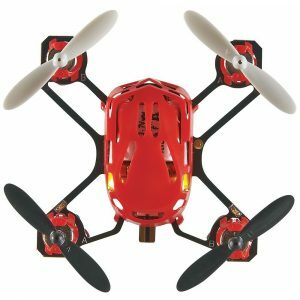 This drone is durable, weather resistant, and aerodynamic as well as wind and shock proof, so even the most crash-happy beginner should be fine flying it. This drone lacks a camera or a decent battery life and is known for having difficult flight performance and control when flying indoors or in confined spaces, which is the main thing that a lot of people want to do with mini drones. 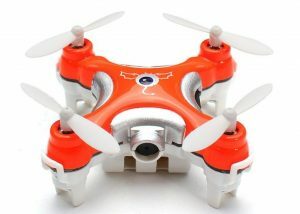 This nano hexacopter has an awesome design, cool features, and an even better price going for it. 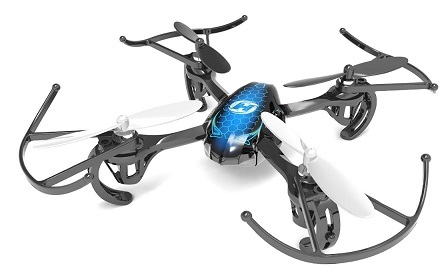 This nano quadcopter is the perfect choice for learning how a drone works. It’s designed to be used inside, has protective measures, and won’t cause holes in your walls should a crash occur! Being a drone enthusiast, if you want something agile and inexpensive in the range of mini-drones, then the Skyviper is an ideal choice for you. 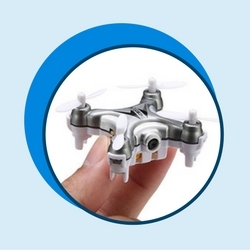 The tiny drone despite having three inches diameter has sophisticated technology with propellers to provide an excellent control to the beginners. 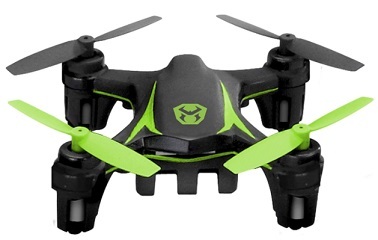 The tough frame and lightweight structure of this microdrone make it a safe choice for the children who are drone enthusiasts. 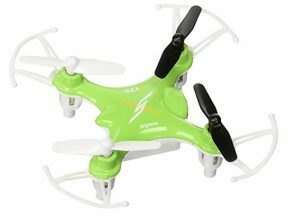 It is agile and easy to maneuver and you can trust this nano quadcopter with your child’s novelty to handle it if they are cautious enough. The Sky Viper has a standard quadcopter design that comes with two different color indicators to highlight its front and back rear that makes flying even easier. The flying capability of this amazing nano drone has a lot more which makes it unique. It can perform various stunts that can be controlled via the designated buttons. It has the capacity to rotate, flip, mid-flight and barrel rolls. For good measure, the adjustable sensitivity provides you with two-speed rates, ranging from 50%-100%, which is an edge for beginners to kick start their learning process. A beginner has much time to react at the speed of 50% while piloting the nano-drone. This nano quadcopter has an interesting orange and white color scheme, as well as a transmitter that looks out of this world. If you find Mini quadcopters challenging to fly that you must try something that flies more like a plane in the drone family. 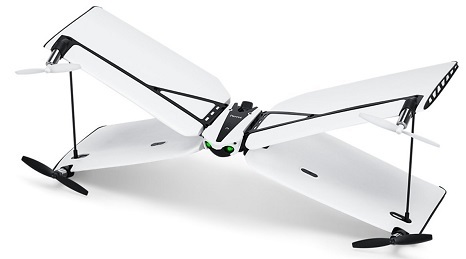 The Parrot PF727004 has a unique X shaped feature with swing wings on the sides. It works with parrot flypad controller that allows you to switch between planes modes and quadcopter. It does not only come with its handy feature, but you get a speed moderator to operate with. In addition to that, this mini-drone has the power and stability of a plane. It gives an experience of flying a supersonic plane with an incredible ease. With the advanced technology of vertical takeoff, an autopilot system and a landing mode, makes the drone only one of its kind – loaded with some extraordinary features. 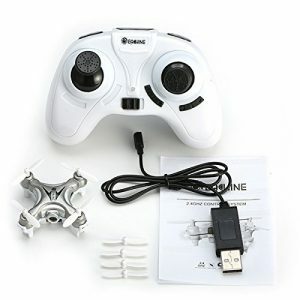 It has a parrot fly-pad controller that gives an ultra-precise control to the beginners to control and enjoy their flight. The Parrot PF727004 gives you the liberty to enjoy a bird-like flight as it has Parrot swings and X- shaped design. Where a micro drone with camera is concerned, we’ve found an absolute beauty. It’s got all the features and specs you could hope for, plus a decent onboard camera. 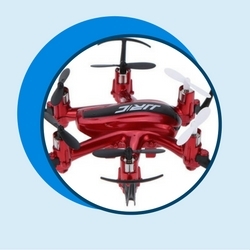 This micro quadcopter comes in red, black, and white and is an awesome choice for those who want a simple model. This nano quadcopter comes in red and white, is great for learning how to fly, and is perfect for all different types of skill levels. This yellow, bee-like nano quadcopter has an awesome look to it, great, features, and is an all around great drone. 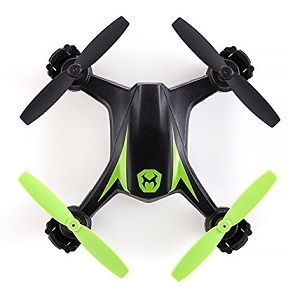 This is one of the best nano drones for sale and it comes in a wide variety of colors – black, green, purple, red, white and yellow. Talking about modern technology and advancement, not adding drones into the discussion would be unfair. In the past few decades, drones have taken off the modern era and blown people’s mind with their dynamic qualities. Varying in size, the application of drones has not only increased but has become famous. Military officials, with the help of this 24-hour eye monitoring system, can monitor everything that is physically beyond their access. If this article hasn’t captured your attention for a micro or nano drone, but you’re still searching for a small and exciting hobby item, consider purchasing a remote control boat. Like a micro or nano drone, they don’t take up much space but pack a punch with speed and excitement on the water. Drones and other remote controlled items can be enjoyed by many. Drones are not only providing constant surveillance, but they are equally fun to use. 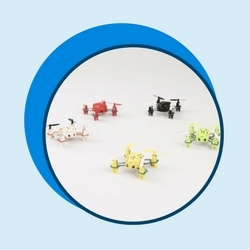 Micro and Nano drones, with all their fantastic fun features, are available in their micro amount of packaging. The devices are not only cute but come with tons of surprises and fun. Micro and Nano drones are often not attracted buyers’ attention due to their tiny structure. But they cannot be overlooked anymore as we are here to show you some great features of micro and nano drones. The tiny device of Nano and microdrones encapsulate many excellent features which are probably larger than life. 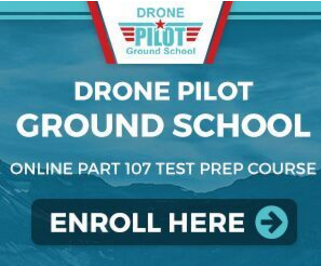 They are typically designed for inexperienced beginners to acquire some necessary skills that are required to fly advanced drones. Nano, micro or mini-drones are not only easy to operate, but they are portable as well as affordable to fly indoors and outdoors. Plus, they have safe landing as their crashes are not destructive. Although both Micro and Nano drones have the same features, the primary difference is of their size. 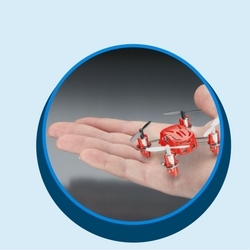 Nano drones are comparatively smaller than micro drones and can fit into the hand and facilitate the indoor flights. On the other side, mini-drones such as micro quad-copter are larger than Nano drones and are suitable for outdoor flights also. The tiny they are, the more fun you can have with them on your trips outdoors or when you’re visiting another country with a breathtaking floras and fauna. 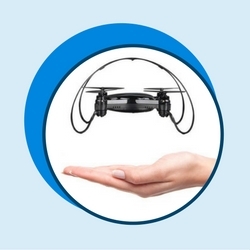 Mini drones have now become common and widely used due to their tiny size and portability. They can be used for search and rescue operations, security purposes and inspection. Not restricted to these, nano drones now can be a great help in your science and research projects to observe nature and the particular environment- volcano eruption, archeological excavation, and glacier surveillance. Making their way to the consumer markets, Nano drones are available at different prices. With an unprecedented list of choices, you can buy a Nano drone for less than $70. Drones like a mini quad copter, although having cool features, entails specific difficulties while flying. Their size and delicate design are sometimes tricky to handle by beginners. These mini-drones could be used for spying and suspicious purposes. If you do not see your question, or an answer to it, listed below, feel free to get in touch with us and we’ll give you one! What’s the difference between a micro and a mini drone? Micro and nano drones share one similarity, being two of the smallest categories of drones, but they are basically the same kind of drone. They share the same size and have different specs, features, you name it. How long can a battery in a mini drone last? Like all drones, the battery life depends on which one you use. Although, nano drones typically use 3.7V batteries, which last for around 5 to 7 minutes, even 8 minutes if you’re lucky. Are nano drones easy to fix? Yes and no. If you have experience with fixing a drone you’ll have somewhat of an easier time doing so, but if you don’t have that experience, it’s definitely not a good idea. Because nano drones are so tiny they can be difficult to fix, so it’s best to leave it to a professional. One wrong move could destroy it completely. Should I get a micro or a mini drone? Before making a decision like this one, you should check out the review section that we have below. We have taken the best of the best and compiled a review of out them, so going through it will give you a couple of ideas about which type and size you’d prefer. Although, because micro and nano drones are generally the same thing, the only thing you’ll really need to worry about is which one you’d like. Can micro drones be flown indoors? Of course! Both micro and mini drones are great for flying indoors and are generally designed with doing so in mind. Because they are small they are perfect for flying inside your home, won’t be too much of a burden, etc. How Do You Fly A Mini-Drone? Do All Nano Drones Have Cameras? Yes, all new Nano drones come with a camera; however, they lack the quality of professional lenses. A compact drone cannot carry the weight of a professional lens while flying. Can You Fly A Mini Quad Copter At Night? Yes, microdrones can be flown and operated at night, but that comes with certain conditions for an uninterrupted filming experience. It is better to turn off the front lights and look out for other obstructions such as power and telephone wires. Should You Fly Mini-Drones Indoors Or Outdoors? If you are stuck in the house and cannot get to the outer field, some mini-drones are safe to fly indoors. 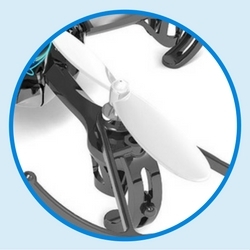 Drones like (quadcopters) have small propellers with a very lightweight to try and fly indoors. Are Nano Drones Suitable For Beginners? Nano drones are small and can be a smart toy to play with. If you are a beginner and want to enjoy this hobby, this is one of the reasonable choices to learn the basics of drone flight. A beginner can master the basic control and access while polishing his/her drone hobby in the future. Is The Battery Life Shorter On Nano Drones? Yes, comparatively, the batteries on Nano drones have a shorter time span than an average drone. The average battery life on a nano drone is seven minutes. If you are buying an expensive model, the battery would last 25 minutes tops. Besides, the strength of a battery is affected due to harsh weather conditions like heavy winds. Your battery won’t last its maximum limit if you keep on trying aerial flips and rolls with your Nano drone even if you are not using camera. Adding weight, like a camera or popup guards, can affect the performance of your battery. Which Micro Drone Has The Longest Flying Time? Flight time is one of the persuasive features behind buying drones. There are anumber of microdrones available in the market, giving you an average ten minutes per flight. 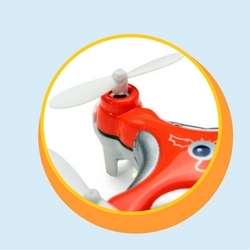 – The Syma micro quadcopter X11 will give you an11-12 minute flight time with 380 MAH batteries. 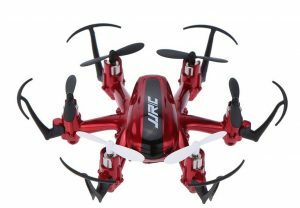 – JJRC JJ100 can be another choice to give you the maximum flying time of 7- 8 minutes with 380 MAH batteries. 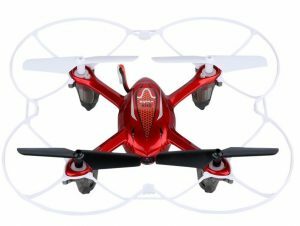 What Is The Difference Between The Cheerson Cx-10 And Skeye Nano Drone? The Cheerson cx-10 a model was launched with a headless structure. It allows the Nano drone to move freely. You do not need to set the positionof the flight direction before it takes off. Plus, its affordable price makes it one of the cheapest drones to buy. It is perfect for the beginners.On the other hand, the Skeye Nano drone is the world’s smallest quadcopter. It has a compact design and a total weight of 11.9-gm. Its light weighted body allows it to be easily and accurately controlled. 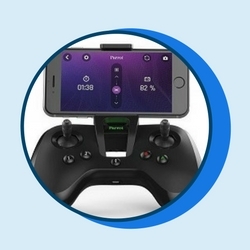 It has an ergonomic controller attached to perform various aerobatic flips mid-flight. The latest technology of Sky Nano drone has high altitude mode to hover steadily at specific altitudes. Can A Parrot Mini Drone Carry A GoPro? GoPro cameras can be mounted on mini parrot drones to increase the embedded intelligence of Nano drones. The latest Parrot mini-drones incorporate some amazing features – from flying longer to capturing high-quality images. Typically, it does not need a GoPro camera to film things. GoPro cameras are made with a compatible design to be carried by any nano drone. To improve the quality of images, it helps Mini parrot drones to experience the culminated power of two batteries and complete flight assistance. Are There Any Mini-Drones That Do Flips? – The new Parrot Mambo has a pre-programmed acrobatic system to perform a number of flip patterns that include, back, front, right and left flip. – The Husband H108 Spyder has a quality flight machine, along with various flip fun features and spins. – The SkyViper1700 is another latest stunt microdrone, and can perform multiple aerial flips. It can flip with aerial rolls as one-touch control stunts. – RC Micro Quadcopter can perform 360 flips. It has propeller guards to protect the blades. How Fast Do Microdrones Typically Go? Microdrones like Extreme Fliers and MD-4 100 are some of the fastest drones with extraordinary features. They can travel up to speeds of 54km/h. The microdrones have been nominated for their impressive speed feature and climb rate. The Md-4 100 has covered a90 minute flight, which is a record in the history of microdrones.With these extensive features, the Md-4 100 has been used for various purposes such as aerial media and scientific mapping. Can I Build A Mini-Drone With Legos? Yes, mini-drones can be made with the help of LEGO Technic. You simply need to follow the instructions. – Gather tools and materials including LEGO, bands, soldering iron, double-sided tape, 307v battery ad hollow cup motors. – Solder the flight controller where the motor is already labeled. – Mount the flight controller and motors in the brick holes. Fix it with the help of tape. Which Mini-Drone Has The Best Camera? Mini drones and nano drones are now available with HD cameras. Beginners can polish their skills of filming and recording with the help of Nano drones such as the Cheerson Cx-10, E010 Mini UFO, and the Skeye Mini Drone. 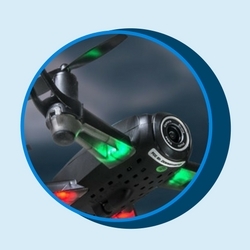 All three drones have a latest HD camera installed with a high-resolution image sensor. The Nano drones can shoothigh-resolution videos with 2 megapixel HD. The cameras are powered by AA batteries and come with a camera kit including a MicroSD card, a charging cable and a card reader. Moreover, SkyEye Mini drone among them has the capability of snapping backwards and forwards with the barrel rolls at amazing speeds. Where Can I Find A Good Microdrone DIY Kit? Discovering your scientific side with micro drone DIY kit is a fun activity. To enjoy this experience, you need a good microdrone DIY kit. There are many online stores where you can find your desired drone kit. Now that you know about the best micro drones and the best nano drones currently out on the market, making a decision regarding which is best for you will be incredibly easy.